The recent media fervor over a driving instructor who took his students off-roading to teach them what it feels like to control a car in a slow slide is just another illustration of how badly we’ve got this whole driving instruction thing wrong. The property damage is one thing and perhaps the University of Charleston field wasn’t the best choice of location for this impromptu skid school, but better there than a busy road: grass grows back. The point the cops are missing here, and that driving instruction in general fails to consider, is how is somebody supposed to learn how to manage a bad situation without experiencing it? Sure, defensive driving is Novice Driver 101, but what happens when all those good intentions pave the road to Hell? A few winters ago, I took my mom out in her aging Subaru WRX Wagon for a few lessons. We belted in and turned out of her driveway onto a slightly slick country road. From the passenger seat, I told her to find 30 mph, and then instructed her to slam on the brakes. It took considerable coaxing, but when I realized that she had never once in her 40-plus years of driving felt the pulse of ABS under her foot, it had to be done. At the first feeling of a mechanical vibration, she reacted exactly as I had expected: she gasped and lifted. Then she was reluctant to use the brakes at all until I assured her that the car was not, indeed, about to burst into flames. Granted, the ABS in a 2003 Subaru is a far less refined feature than what we have today and the behavior of nanny systems is less intrusive now, but it illustrates the problem. Unless you have the experience of handling your steel cage on wheels in less than ideal conditions, you will never be prepared to take care of yourself in a crisis situation. Lacking experience, instinct takes over and, frankly, instinct wasn’t designed for drivers. I was fortunate enough to learn my most valuable driving lesson in the company of a champion rally driver. With Frank Sprongl navigating from the passenger seat, I was driving a back road in northern Michigan. I wasn’t going faster than usual – I learned long ago that no civilian driver should ever try to impress a pro – when the VW Golf we were in lost grip on an icy hill. As we picked up speed, instinct took over and I pushed deeper into the brakes. Nothing. We continued to slide as a battered pick-up truck rounded the corner at the foot of the hill, on a precise collision course. As I studied the truck we were about to hit, time stretched to eternity and blood rushed in my ears. I already had the brake pedal on the floor so I did the only other thing I could think of and desperately cranked at the wheel. That didn't work either. Frank’s calm voice reached through my fear with a gentle directive: “Lift… and steer.” That's all he said as he gently reached over to point past the truck, drawing my gaze with his hand, and releasing my target fixation. I didn’t have time to question him, I just did it: I picked both feet up off the pedals, wrenched my gaze past the truck to where we needed to go, and turned the wheel. It worked, of course. And once we were well clear of the pick-up, I stopped the car to recover my nerves. I remember being completely surprised that what seemed like a counter-intuitive instruction – to lift my foot off the brakes – had saved us from the crash. Gasping with relieved laughter at the near miss, I remember asking Frank how he knew what to do. He just shrugged and smiled, like it was the most natural thing in the world. Most people aren’t lucky enough to have a professional racing driver to take over the wheel when they run out of their meager talent on a public road. Driving instruction should do a better job of teaching them what to do. It’s all well and good to tell novice drivers to brake in a straight line and turn once they’re at their desired cornering speed, but that leaves them ill-prepared when they find out the hard way what happens when they exceed the limits of traction by trying to do both. In terms of skid control, all my teachers gave me the same obtuse instruction that I should "steer into the skid." What does that mean? Anybody who's done it knows that’s a very poor articulation of the series of moves it really takes to straighten out a sliding car. There are countless articles out there that break down the basics. I even wrote one (self link – here – life’s too short to write the same article multiple times). Do yourself a favor: if you've never spent any time learning how to drive, really learning, then find yourself a beater car, a safe and empty parking lot (preferably wet or icy), and take some time to become a better driver. Better yet, call Edwin "Bud" Anderson. Maybe he’ll have a few openings when they let him out of jail. 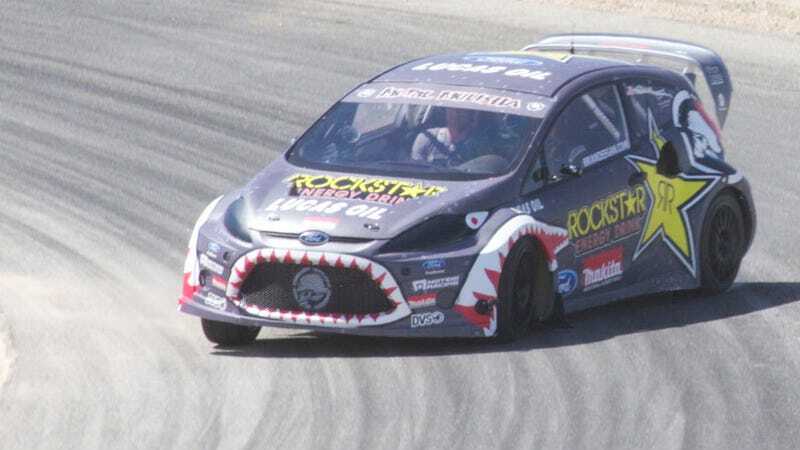 *Photo: Brian Deegan steers into a skid. Whatever that means. Dumb public transport official: "We don&apos;t need no stinkin&apos; snow tires"